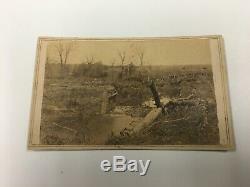 This lot features a very rare Civil War image from the Bull Run (Manassas) Battlefield taken by the iconic Civil War photographer Matthew Brady. Taken shortly after the battle, this image offers a glimpse of the field at Manassas as it actually appeared in 1861. A detailed description of the image is shown on the back of the card. Thank you and best of luck! 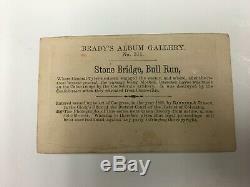 The item "Stone Bridge at Bull Run Matthew Brady Studio CDV Civil War Manassas Very Rare" is in sale since Thursday, April 4, 2019. This item is in the category "Collectibles\Militaria\Civil War (1861-65)\Original Period Items\Photographs". The seller is "steeler_rarities" and is located in West Newton, Pennsylvania.